Nuts are heart healthy and enjoyed all over India as a snack but sometimes in ice cream or dals. Eating almonds, walnuts, pistachios, peanuts and other nuts increase your HDL-cholesterol (i.e., good) and lower LDL-cholesterol (bad), especially if you have high cholesterol levels (Sabaté 2010 Archives of Internal Medicine). Eating them regulary (a handful of nuts at least 4 times a week) not only improves cholesterol levels, it actually reduces the risk of coronary heart disease and heart attacks (Fraser 2002 Archives or Internal Medicine, Hu 1998 British Medical Journal). How do they work? 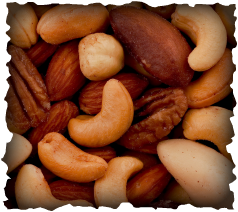 Phytonutrients in nuts probably behave as antioxidants, which likely reduce oxidative-related inflammation in the coronary arteries. Nuts also contain good fats like omega-3 fatty acid, which also seems to protect the heart by reducing the kind of inflammation that causes problems.